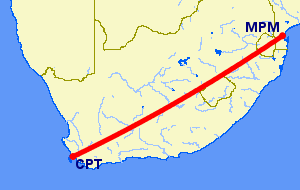 Cape Town to Maputo was the only direct flight to Mozambique from CPT, unless SA Express stopped flying the route. There are still 1-stop options via Johannesburg. The way to make sure that you get the cheapest flight to Maputo from Cape Town is to first check the airfare of every airline before you go to a travel agent and ask them to beat that price (some travel agents guarantee to do this). If you've got more time and you're flexible about dates, it's worthwhile to get on the airlines' mailing lists, and wait for them to email out offers for cheap flights. Flights leaving on Fridays are usually more expensive (everybody wants to get away at the start of the weekend). 15 May 2014 : South African Express quits CPT to MPM flights. Since the 8th Feb 2014 there are no more 1-stop flights with British Airways, as it quit the JNB-MPM leg of the route.